A man has told the Ballymurphy inquest how, as a terrified teenager, he witnessed the fatal shootings of four people while under heavy fire. Tommy Morgan is now 62, but was 15 years old on 9 August 1971. Ten people were killed during three days of gunfire in Ballymurphy in August 1971 in disturbances following the introduction of internment. Mr Morgan told the court he has had great difficulty dealing with his memories over the years. He described a "storm of bullets" as he stood with friends on the Springmartin Road. Thinking the shooting came from loyalists in Springmartin, he ran towards the area known as the Manse and took cover behind some gate pillars. A Presbyterian manse had recently been demolished there. He told the court he now believed that shooting came from soldiers based at the Henry Taggart Memorial Hall opposite, because of the direction from which people near him were shot. A barrister for the Ministry of Defence said the Army view had been that their soldiers had come under fire from the Manse area. Mr Morgan did not see any soldiers at the base shooting in his direction. He described the heavy shooting and how lumps of stone and plaster came out of the gate pillars as bullets struck them. "It got really unbelievably intense" he said, "It was like a storm. The bullets were non-stop." He also described how he could hear a metal fence nearby pinging as bullets struck it. He saw Noel Phillips and Danny Teggart fall and pitch forward, he said, shot whilst trying to escape across the waste ground. He saw Joseph Murphy hit beside him and slowly lie down and go quiet. 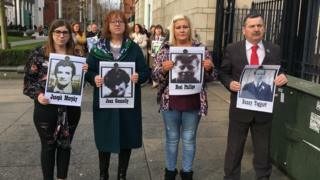 He heard the cries of Joan Connolly, the only woman shot dead in the Ballymurphy shootings. He described her "crying, sobbing, frightened, terrified voice". He told the court she shouted several times, "Someone help me please, I'm blind, I'm shot in the face, I can't see." "I'm glad I didn't see her" said Mr Morgan. "The voice is still with me". He saw a friend called Davy Callaghan shot close to him and says he and the others stayed in the field for a few hours. At one stage he said he saw an IRA man with a rifle at the far side of the field who took aim at them, perhaps thinking they were loyalist gunmen. He said a man with him, Dessie Crone, shouted at the man "We're your own, we're your own." He said the IRA man then left without firing his weapon at them or at the Army. He added that no one shot or taking cover in the field had or fired a weapon, and that they were all "innocent unarmed civilians". Later he described an Army Saracen entering the field and paratroopers throwing bodies into the back of it. After collecting some bodies, he said, it reversed back up to the pillars where he was lying, and stopped to collect more. He explained he thought it was a miracle that the soldiers had not noticed him or two others lying with him. He even thought they might have been coming to help them, and had begun to shout "we're here" when another man put his hand over his mouth. He told the court the paratroopers were laughing and joking as they collected bodies, lifting them by one arm and one leg and swinging them into the back of the Saracen, which then drove off. Later he says he heard a soldier make a loud hailer announcement from the base as it got dark, giving them three minutes to remove the wounded. He described how although he was unhurt, the two others lifted him as if he were wounded, and slowly took him across the field to safety in a nearby house. Later the court heard evidence from Margaret Elmore, then Margaret O'Hare. She was 27 in 1971 and lived with her mother and sister in the house beside the Manse site. Mrs Elmore explained that she had been talking to a crowd of between 10 and 15 people at her front gate, including Joan Connolly, when the shooting started and everyone ran for cover. She described two armoured vehicles speeding out of the Henry Taggart base, down the Springfield Road towards her house, although she did not see if or where they stopped. With bullets flying over people's heads, she said, she went to the upstairs window in the house that overlooked the Manse ground to see what was happening. She said she could see Mrs Connolly along with a man, both taking cover in bushes below her and heard the man telling Mrs Connolly to stay down. Mrs Elmore said she recalled knocking the window to warn them to get down too. Then she described Mrs Connolly making a quarter turn and falling. In tears in the witness box, Mrs Elmore told the court that Mrs Connolly said quietly: "Mister, I can't see." Mrs Elmore said she could see that Mrs Connolly's face had been shot off. She described moving back from the window before she was shot herself and did not see anything else that happened in the Manse that night. She pointed out that bullets did strike her home. Later a young man burst into the house seeking cover and stayed with the family that night.